V Knits: FO as promised! These were a much quicker knit than Pomatomus and also, a better fit. The toe decreases were a little weird. 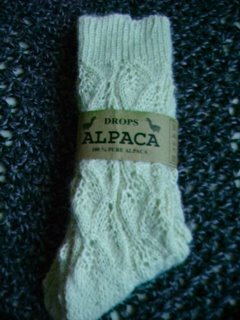 I think they were probably made to look like the tips of the leaves pattern, but one line of decreases ends up right under the toes, which makes for lumps under the toes. **Blogger is back up, pictures have been added. posted by Venus @ 10:44 a.m.
Mmm, beautiful socks! And alpacaaaa. Wow, those socks look great. I can see how they wanted to continue the leaves pattern into the toe, but maybe they should have just left the toe normal if it turned out funny. Those are so cool! I have some of that yarn in blue! I may give it a whirl!